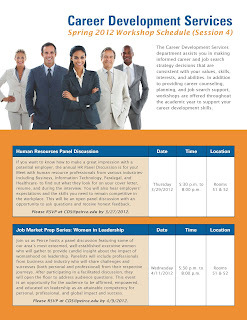 We have a lot going on in Career Development Services (CDS) this spring. With graduation just around the corner, there’s no better time than now to start thinking about your career preparation! Whether you’re graduating soon, looking for an internship, or changing careers, we have sessions that can help you plan your next steps. Check out the flyer below for information about the Spring 2012 CDS workshops. Here’s what’s on deck. Learn how to make a great impression on employers at a panel discussion with human resource professionals. Hear from women in leadership as they offer candid insight about being a female executive. Prepare for graduate school with tips about the application process and practice entrance exams. Be sure to reserve your spot now. These workshops are sure to fill up fast! Call 888-467-9476, ext. 9202, or send us an email. Remember, you can always make an appointment with a counselor for a one-on-one session if you can’t fit one of these workshops into your schedule, or if you’re interested in learning more about a topic you aren’t seeing here.